^ a b Malaysia Regions. http://www.2malaysia.com/states.htm. 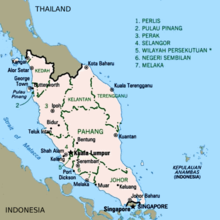 ^ Some aspects of Malay-Muslim Ethnicity in Peninsular Malaysia. (June 1981). JSTOR 25797648.